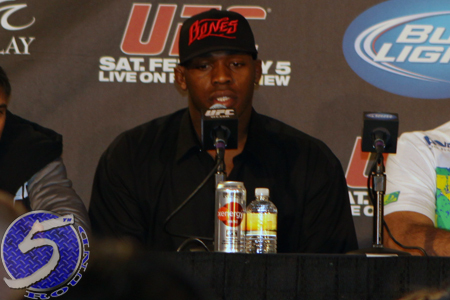 “UFC 140: Jones vs. Machida” takes place December 10th and features a light heavyweight title scrap between champion Jon Jones (Pictured) and Lyoto Machida. To help hype the pay-per-view broadcast, the company will host a press conference today inside the Air Canada Centre at 1PM ET/10AM PT. Wednesday’s festivities are free and open to the public. If you’re unable to attend the presser, you can stream it live HERE. In addition Jones and Machida, UFC president Dana White and UFC director of Canadian operations Tom Wright will be joining the 205-pounders at the podium. “After his performance against Quinton ‘Rampage’ Jackson, there’s no doubt that Jon Jones is one of the top pound-for-pound fighters in the sport,” White said. “He’s already beaten Mauricio ‘Shogun’ Rua and Rampage this year and now he gets Machida, a former champion. Machida is one of the most elusive and dangerous strikers in the UFC and he’s motivated to get the belt back. As if that weren’t enough, the UFC will also hold a special fan autograph session for Jones and Machida from 5PM to 6PM at Real Sports Apparel located in Maple Leaf Square.